Taking into account information security and data privacy aspects in IT projects remains a thorny issue for most organizations. This talk seeks to demonstrate how threat modelling is a powerful technique to address this gap efficiently. First, an overview of current threat modelling best practices and their limitations will be presented, followed by an optimized approach developed to integrate information security and data privacy efficiently into IT projects. A quick demo of a prototype tool supporting the presented methodology will also take place. The presentation is held in the Sponsoring Track at 15:20 by Stéphane Adamiste, ELCA Senior Consultant. With ELCA you will receive a 15% cost reduction. 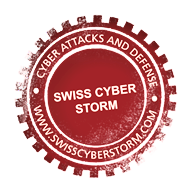 As a sponsor, ELCA will be present at the Swiss Cyber Storm Conference with a presentation and a stand. We can offer you in addition a reduced entrance fee for the event. Simply fill out the form below and we will forward you the voucher code.